James Brennan was born on 4 January 1867 at Saul Street, Downpatrick, County Down, the fourth of nine children of labourer and ex-soldier Laughlin Brennan and his wife Mary (nee Foy). Brennan enlisted in the 3rd Dragoon Guards at Holywood in May 1885 at the age of 18 (No.2594). He gave his occupation as labourer, and was at the time unable to read or write. He also stated that he had previously served in the 3rd Battalion, Royal Irish Rifles. Two months later he was transferred to the 8th Hussars (No.2706). In April the following year he was imprisoned for eight weeks – the nature of the offence was not recorded on his file. Brennan embarked for India with the 8th Hussars on 7 September 1886, returning home three years later. On 9 January 1890 he married Mary Josephine Graham at Dundrum. The couple had at least one child before Mary's death sometime in the 1890s. On 8 February 1897 he transferred to the 7th Hussars (No.4242) and in December that year embarked for Natal. He returned home 11 months later. On 30 June 1901 Brennan was discharged at Aldershot "having been found medically unfit for further service". A notation on his file states simply "lunatic", and that his intended place of residence was the Downpatrick Asylum. His conduct and character however were recorded as "good". It appears that Brennan recovered quickly. On 11 December 1901 he married Jennie Fitzsimons at the Roman Catholic Chapel at St Matthews in Belfast. He gave his profession as working in the fire brigade. The couple had four children over the next decade. By 1911 they were living at the Whitla Street Fire Station in Belfast, Brennan working as a fireman. Brennan enlisted in the North Irish Horse at Belfast on 19 October 1914 (No.1319). He was 47 years old at the time. He remained with the regiment on home service until 9 July 1917, when he was transferred to the Labour Corps (No.333697) and posted to the 664th Home Service Labour Company, retaining his sergeant's rank. Two months later he was posted to the 395th Home Service Labour Company. Brennan was transferred to Class Z, Army Reserve, on 2 February 1919. His character was recorded as "very good". Soon after he was awarded a Long Service and Good Conduct Medal. 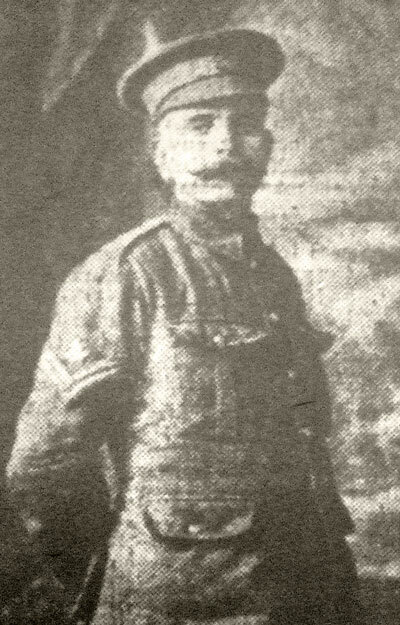 First image from the Belfast Evening Telegraph, December 1914, kindly provided by Nigel Henderson, Researcher at History Hub Ulster (www.greatwarbelfastclippings.com). The second picture can be seen in its full context here.